Varanasi is a city that is hard to describe in words. There is actually not a lot to see and do if it comes to site-seeing. Varanasi is a typical dirty Indian city with a lot of temples, but not one of them will leave you in awe. And yet, Varanasi was an unforgettable experience for me. As an anthropologist Varanasi was a dream come true. A never ending show of Hindu rituals that I could observe up close. The Ghats at the Ganges river are like a theater where day and night performances are going on. Hindu families come here every day to pray and celebrate the major life events in their families. A baby is born, the baby eats its first rice, a couple is getting married or farewells are said to lost loved ones. You can hear the bells of the temples, the chants of prayers and the music of celebrations everywhere. Being from the Netherlands I am used to my privacy and own personal space, but these things have a different meaning in India. It sometimes felt uneasy to be present and watch such intimate moments in people’s lives. My first afternoon I went to see the cremation ghats. The Ganges is a holy river and Hindu’s believe that a cremation on the banks of the river Ganges will free the soul from the cycle of death and rebirth. The bodies are placed on pillars of wood and the rituals are performed in full view for anyone to see. It’s a privilege to be burned in Varanasi, but not everybody can afford the expenses. I was invited to visit the elderly home right behind the cremation ghats. Because of my work with elderly people in the Netherlands I was curious. Several old women lived in one room where they had nothing more than a bed and a small table. They came from all over India, but when they felt their time was coming, they sold all their belongings and moved to Varanasi to make sure their remains would unite with the holy Ganges. The women, already widowed, seemed at peace with their coming end. They also didn’t seem to mind the fact that the owner was bringing in tourists in the hope for donations that according to him would be to pay for the funerals. I left with mixed feelings tough. Dead and birth are close to each other in Varanasi. One Hindu priest may perform the prayers for a family who just lost a loved one while the priest next to him might perform prayers for a new-born baby. Watching these elaborate rituals and the smiles and tears from the people involved, makes you wonder and reflect on life in general. Varanasi is a spiritual place that inspired my toughts. I felt small in the presence of something that was bigger than myself. A connection with the cycle of life that is so visible and concrete in this place. Among these significant events daily life goes on as well. The Ganges is the heart of Varanasi where everything happens. People take a bath, wash clothes and make business as usual. Hindu priests, street vendors, dhobi wallah’s, dentists, barbers and tourists all wander around. Looking back at my time in Varanasi I didn’t do anything in particular. I took a boat ride in the evening to see the sunset and the daily evening prayers. The rest of my time I just walked around or sat down to drink a cup of Indian milk tea and watch what was happening around me. I was lucky to be able to visit Varanasi twice. During my second visit I witnessed the festival of Saraswati puja. The day where they pray to the goddess of education and knowledge. Students make idols and would walk around town towards the Ganges. Here they would bring Saraswati back home by throwing the beautiful handmade dolls in the river. This was Varanasi like I never saw it before. During the day the processions were a rather fun affair with women singing and dancing and curious happy schoolkids. But during the night things heated up with now mostly young men walking through town. They played loud music on stereo speakers and threw pink color powder to each other. Some of them were under influence of alcohol or bang (weed). Not the best time to be out for me travelling alone as a female. On my last day in Varanasi I headed back to my hotel early to watch the celebrations from the rooftop terrace. The next day I would leave towards Nepal and all I could think was what a great farewell to India this was. The best way to reach Varanasi is by train. There are frequent trains from the major cities in India like Delhi (13 hours) & Kolkata (14 hours). There is also an airport in Varanasi with daily flights to Delhi, Mumbai, Kolkata & Kathmandu. I remember. For some obscure reason the bus to Nepal didn’t go and we stayed a day longer in Varanasi. No punishment at all. Thank you for bring back memories. I loved my time in Varanasi. Such a spiritual place. You are right if you are coming to sight see then it is not the place for you but if you have come to see the culture, watch the colours and have every sense explode then this is the place for you. Your photos are great. So many great natural ones. My goodness, India seems so colourful. I really love that. These photos you’ve taken are really beautiful by the way! I honestly feel like I’m there and I would love to go now. You really painted a picture… nice work! I’ve never heard of Varanisi before so I enjoyed reading this. The city looks like a colourful, vibrant place! It must have been interesting to see the elderly home there too. In India I’ve only visited New Dehli and Bangalore. But none of these 2 can compare with Varanasi. It’s much more colourful, and so much more going on. I would love to see all the rituals, sit along the Ganges and observe all that is happening around me. India has always been in my bucket list. VAranasi looks relax and dull with tradition! Would love to come visit! An honest overview of Varanasi! I haven’t been yet but have travelled to many other places in India. Adding this to my next visit to India. Wow what a powerful place you’ve visited and the experience sounds so moving. It can be rare to come across these true gems of travel anymore – with tourism becoming somewhat of a commodity. Glad you were able to explore off the beaten path and soak up some of India’s beautiful culture! Stunning photos of a beautiful place! I haven’t been to India yet either, but this post definitely makes me want to. What a fascinating insight into the traditions of another culture. I visited Sri Lanka back in October and would love to explore India one day too. Lovely read. Once I’d love to visit India. Varanasi is also on my list! Looks like you had a great time (and timing) there to observe the celebrations too! Beautiful post Ellis, I’m happy to have found your blog! The pictures really capture the essence of Varanasi. Oddly enough, it was Varanasi that first drew me to India. I saw pictures and travel shows, and knew I had to go there. So I went there on my first trip to India in 2015 and just fell in love with the place. It may be filthy, dusty and not the easiest place as a traveller but there’s something about the Soul of Varanasi that just takes you over… or for me anyway. I did a morning boat trip which was magical seeing the sunrise opposite the ghats. I have not been to Varanasi but I have heard a lot about it. Hope to make it there sometime. Love that your pictures show it as it is and not just the colorful/religious parts. 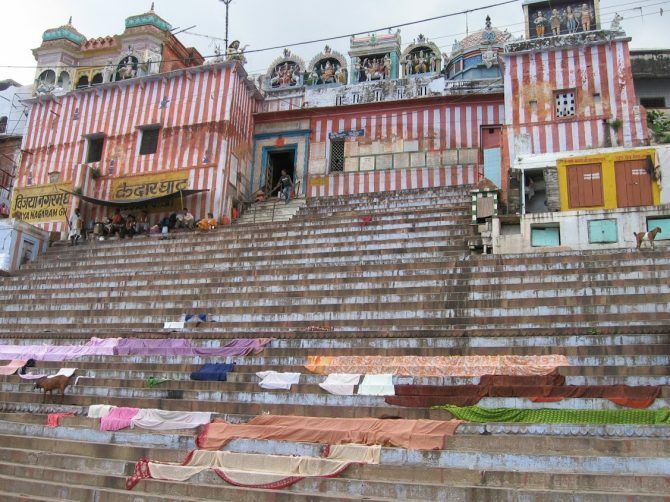 Hi, you wrote an amazing post on the traditions of Varanasi. I really loved your post as well as your writing style. I also wrote on a similar topic. You can check it out on my website. Keep doing your good work. Much Thanks To You!! !